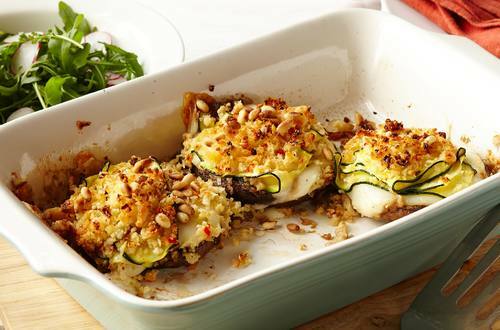 Succulent mushrooms stuffed with goat cheese, red chili pepper, green onion and creamy Hellmann's® or Best Foods® Real Mayonnaise, then topped with zucchini ribbons and baked until golden. 2 Arrange mushrooms in 2-qt. baking dish, stem side up. Bake 5 minutes. Top each with 1 slice goat cheese and continue baking 10 minutes. 3 Combine bread crumbs, cheese, Hellmann's® or Best Foods® Real Mayonnaise, grated lemon peel, lemon juice, red chile pepper and green onion in small bowl. Evenly top mushrooms with bread crumb mixture, then zucchini. Bake an additional 15 minutes or until golden. Garnish with pine nuts.